What is gaming addiction, exactly? There is an easy answer to that question, but there is also, naturally, much debate about whether or not it is even a thing. Psychology can at times be an inexact science, and it seems as though there is always room for debate within that world. As of today, gaming addiction is not a condition for which your insurance company will reimburse mental health professionals who treat you for it, and that is because the very definition of addiction is still in the process of evolving to the point where problematic gaming can be included under its umbrella. And so in order to fully understand gaming addiction and the debate over its validity, we must start at the root of the term. In the grand scheme of time, addiction has only relatively recently become a medical concept. Before doctors started saying that folks were "addicted" to opium less than two centuries ago, the word "addiction" meant something different. From that point, the scientists and doctors of the world took that word to mean a physical dependence on a substance. Even more recently, we—the normal, non-scientist humans—have come to use "addicted" within the context of behaviors. We find a thing we like to do, and we partake in that thing more than other people do—perhaps to an emotionally unhealthy degree—and we call ourselves addicted to that activity. But that is not scientific. In 2010, the American Psychiatric Association revealed the first draft of revisions to its new edition of the psychological bible, the Diagnostic and Statistical Manual of Mental Disorders (DSM). Among those changes was a new category of disorders: "behavioral addictions." Within that category we would find a single disorder, gambling addiction. Behavioral addictions are still a very contentious issue, and that the category was even included in a proposed draft is a big step toward acceptance. This was the first sign that the idea that addiction could refer to something other than a physical dependence was beginning to be accepted within the scientific community. Of course, there was still much opposition to this proposal. Many psychiatrists and psychologists were afraid that making such a category would start us down a slippery slope, that it would open the door to too many normal activities being labeled disorders. As such, there was no mention of the behavioral addiction category in the final draft summary of changes for the DSM-V in December 2012. I'm told that's because that category will not be in the published edition of the manual, but we will find out for sure when it is released in May of this year. That this idea may not be included is not a huge deal, given its small scope in this edition. It isn't as though pathological gambling won't still be in the book. But behavioral addictions are still a very contentious issue, and that the category was even included in a proposed draft is a big step toward acceptance. Even if it doesn't go in now, it will come up again in the next revision within a decade. Big changes to a standard like the DSM come slowly. "Gaming addiction" will definitely not be in the new DSM, at least not as an official disorder. But some version of that idea will be contained within the Section 3 appendix, which is where the APA describes concepts that need further study before receiving an official disorder. There we will be able to find a nebulous idea called "Internet use gaming disorder." Right now, we do not know exactly what that means, but logic dictates it is a combination of Internet addiction and online gaming addiction. Since behavioral addictions are not yet full accepted within the psychological community, we don't usually use the term "gaming addiction" in official chatter. Instead, we take a cue from what previous editions of the DSM called problem gambling and refer to it as "pathological gaming." You will have seen this term in my last article here on Kotaku. As we move forward with the new DSM, I expect use of that term will continue but be mixed with other terms like "gaming addiction" or "gaming disorder." That "Internet use gaming disorder" will be in the DSM-V appendix is a big step for scientific development of the pathological gaming concept, as there aren't currently many published studies on the subject, and the APA is quite right to not give that problem a full classification at this time because of that. But now our psychological researchers will have a mandate to study this issue, and we should in the coming years have a better grasp on the idea. Studies on the brain have shown that behavioral addictions cause the same changes in neural activity that substance addiction does. "Pathological use of video games in empirical research is generally measured in the main elements of addictive behaviour, such as [R.I.F.] Brown's core facets of addiction: salience (the activity dominates the person's life, either cognitively or behaviourally), euphoria/relief (the activity provides a ‘high' or relief of unpleasant feelings), tolerance (greater activity is needed to achieve the same ‘high'), withdrawal symptoms (the experience of unpleasant physical effects or negative emotions when unable to engage in the activity), conﬂict (the activity leads to conﬂict with others, work, obligations, or the self) and relapse and reinstatement (the activity is continued despite attempts to abstain from it)." Seeing as how research shows a not-insignificant number of gamers fit those criteria, I'd say that's compelling evidence that pathological gaming is an actual thing. But it's more than just that. Studies on the brain have shown that behavioral addictions cause the same changes in neural activity that substance addiction does, and treatments for substance dependence often work on these impulse-control problems. Yes, there are addiction centers that treat conditions like pathological gaming. As with most psychological evaluations, it can be difficult to determine if a person is addicted to gaming without studying that person's life. And so, as with most psychological evaluations, we must depend on self-report to help us out. And when dealing with large numbers of people at once, as researchers do, we need surveys. Here is an example of one such survey, given in the study quoted earlier. It's geared toward school-aged children, so keep that in mind. Has your schoolwork suffered because you spent too much time playing computer- or video-games? Have you ever skipped your studies or co-curricular activities to play more computer- or video-games? Do you need to spend more and more time and/or money on VGs to feel the same amount of excitement? Have you played VGs to escape from problems, bad feelings, or stress? Are you thinking about computer- or video-games more and more? Have you stolen a VG from a store or a friend, or stolen money in order to buy a VG? Have you tried to play VGs less often or for shorter periods of time, but are unsuccessful? Have you become restless or irritable when trying to cut down or stop playing computer- or video games? Have you ever lied to family or friends about how much you play VGs? Have you ever needed to borrow money so you could get or play computer- or video-games? In the above survey, participants respond with yes, no, or sometimes, with a yes equal to 1, a sometimes equal to .5 and a no equal to 0. If the subject's points add up to 5, they are considered to be pathological for the purposes of the study. This questionnaire is based on the DSM criteria for pathological gambling, naturally, and the 5-point requirement for classification is a DSM standard. This is fairly standard for research into gaming addiction thus far. Of course, pathological gaming is still on the frontier in the world of psychology, so the questions above are a standard but not the standard. 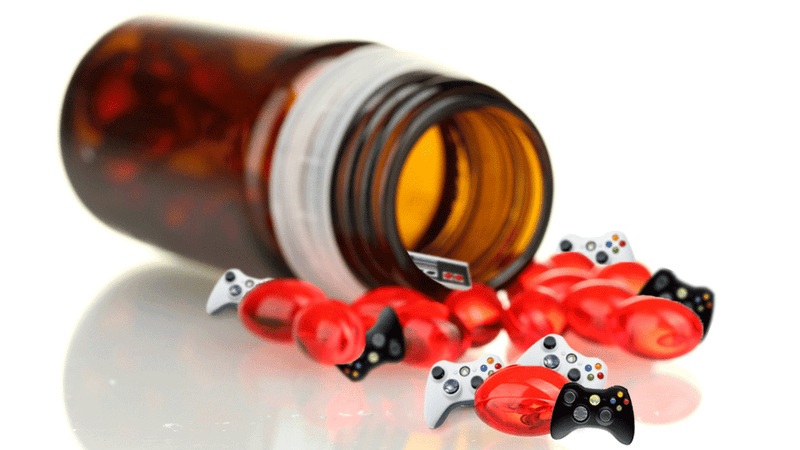 There is no standard, officially, on this topic, but we will have a little better view once we can see the Section 3 appendix entry on "Internet use gaming disorder" in the DSM-V in May. In the meantime, there are plenty of psychological and psychiatric professionals out there who will tell you that gaming addiction is a very real problem for some gamers—with research, including the study I reference earlier, indicating that as many as one eleventh of us could be dealing with it—and inclusion in the DSM-V appendix means more studies are coming. The next few years should be very enlightening on this topic.